TV show dates: October 16, 2018 — present. 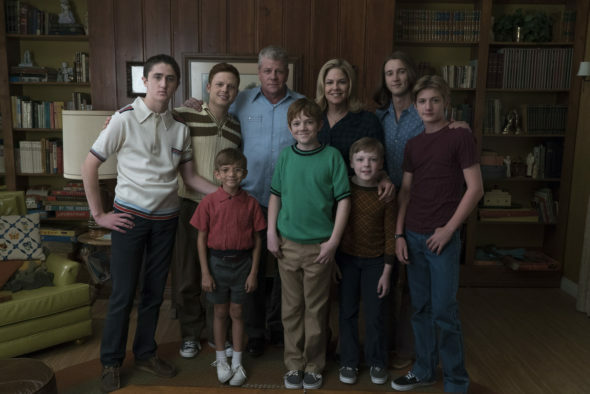 Performers include: Michael Cudlitz, Mary McCormack, Sam Straley, Caleb Foote, Sawyer Barth, Christopher Paul Richards, Jack Gore, Andy Walken, and Santino Barnard. From creator Tim Doyle, The Kids Are Alright TV show is an ensemble sitcom, set in the 1970s. The series follows the Cleary family, a traditional Irish-Catholic clan, as they live out their lives amidst the upheaval of the 1970s. The story unfolds in a great Los Angeles working-class neighborhood. The family is headed up by married couple Peggy (McCormack) and Mike Cleary (Cudlitz), who are raising eight rowdy and energetic sons. Because this is the 70s, the boys live most of their lives outside, and they do so with a lack of supervision that might cause modern helicopter parents to faint. Their lives are chugging along more as less as expected, until the Clearys’ eldest son, Lawrence (Straley) comes home to announce he’s quitting the seminary. Instead of pursuing the priesthood, he wants to embark on a mission to “save the world.” Mike and Peggy never expected to be raising their brood in such turbulence, but as the song goes, the times they are a-changing. What do you think? Do you like The Kids Are Alright TV series? Should this ABC TV show be cancelled or renewed for another season? Love this show!! Such a fresh brand of humor, and they do nail the period perfectly. Great acting and writing. Keep it going!!!! This is my favorite show on TV. Please don’t cancel it! Get rid of the weird color and do a better job of promoting it! I grew up in a family of 3 girls and we attended a small town Catholic School in the mid 60’s to early 70’s . I knew families like The Kids Are Alright and this show nails the era perfectly. Love this show and the humor it brings. The Kids Are Alright is my favorite show. Having grown up in the 70s I can speak to its authenticity. It also makes me glad I have sisters and not brothers. Love the show and the inside jokes. Great writing and spot on acting. Lets hope for season 2. This is the funniest show on TV right now! I grew up in a family that had a lot of boys, and this show gets it right. Each boy has a totally different personality. Christopher Paul Cleary, who plays Joey is fantastic! Caleb Foote, who plays Edie is hilarious! I would hate this show to be cancelled. If it is, it will be because ABC didn’t promote it enough.